Hi! I’m Meredith from The Palette Muse, where I create Home Decor, DIY, Crafts, and Organizing projects. I love to inspire people with their own projects, and offer encouragement along the way. DIY-ing can be intimidating, but oh-so-fun and rewarding! I specialize in easy tutorials using common, easily-accessible, and safe materials. But every now and then I take on a big project, such as re-tiling my whole living area or repainting my kitchen cabinets! When I set out to repaint my kitchen cabinets, I knew it was a project I’d only want to do once. Ever. I also knew, from several earlier projects, that the doors would be the trickiest part. I was so pleased with the process I used and its results that I’m thrilled to share it with you here on Remodelaholic today. A horizontal surface to lay the doors on during painting and drying time. I used Benjamin Moore Advance paint and primer, which is specially designed to cut down on brush strokes. You can see the strokes as you apply the paint, but it levels out as it dries. In order to have time to level out, the drying process takes a little longer, but it’s so worth the wait! I had fallen in love with a Valspar color, “Totten’s Inlet”, so when I decided on Ben Moore paint, I simply asked them to mix it in this color for me, in a satin finish. I also used a 4″ mohair roller (which sounds expensive but actually was about the same price as a foam roller) for the flat surfaces of the doors, and a foam craft brush to get into the crevices and molding. I set up my workspace so that I could lay the doors on a flat surface to work on them. Using sawhorses and two-by-fours, I made long worktables. This way, I could paint a door and leave it to dry while moving on to the next door. 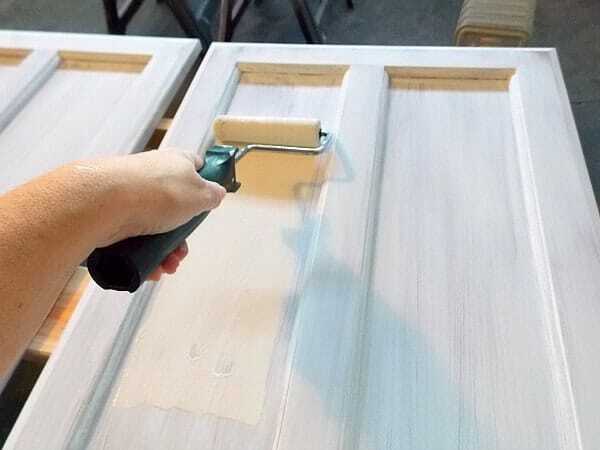 The longer you can let your doors lay flat, the better the paint can dry, which cuts down on drips. Drips are caused by gravity working on wet paint, so you can imagine that if you put a bunch of paint on a flat surface, then stand it up vertically, the wet paint will start to slide down the surface, leaving drips. Argh! That’s not what we want. So do yourself a favor, and put some thought into how you’ll keep your doors flat for as long as possible. So, now that you have a workspace in mind, let’s move on to the process. First, label all your doors and cabinets. (Do not remove a single door until it’s labeled! I promise this step is worth the few minutes it takes.) Then remove the hinges and knobs. If you have adjustable hinges, label them and put them inside each cabinet so you don’t have to readjust all of them when you rehang your doors. Clean the doors with a good degreaser, such as Krud Kutter. Sand thoroughly. You want to remove all the gloss from the previous surface so the primer and paint can adhere well. You do not need to remove all the stain or paint, just the surface layer of gloss. Clean well. I used a vacuum cleaner attachment, then a microfiber cloth with rubbing alcohol. Do not use water or it will raise the grain of the wood, which interferes with a smooth finish. Roll on primer onto flat surfaces, then use the brush to apply a light coat into all the molding edges. Allow primer to dry completely.A word about priming: Yes, you should do it. Sanding makes the surface easier for the paint to adhere to, and priming makes the paint coverage look more even and prevents stains from showing through. They do not serve the same purpose, and for a really professional looking job, I recommend doing both. Caulk any open seams between the panels and the molding. Allow caulk to dry completely. This seems like a small detail, but it really makes a difference in the finished product! Sand lightly again with 200 grit sandpaper. Clean well again. Now you are ready for a coat of paint, and a little finesse in how you apply it. I found that there is an order that helps eliminate brush strokes and drips. Basically, you want to work from the lowest panel surface to the highest. First, use the roller on the interior panel. Then use the foam brush to add paint to the molding between the interior and exterior panels. Then use the roller again on the exterior, or top, panels and around the edges of the doors. 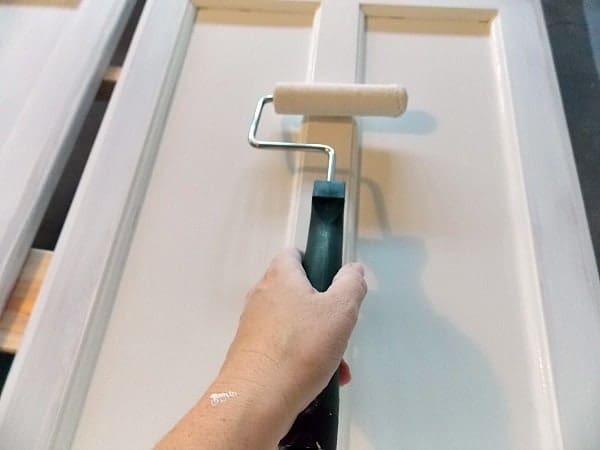 This way, you can smooth out any extra paint left on the edges from the brush.Don’t overload your brush and roller, and attempt to get a nice light, even coat of paint on the door. Too much paint at one time can lead to drips forming. Once the paint is dry (follow manufacturer directions on the can and don’t rush! ), sand and clean again. 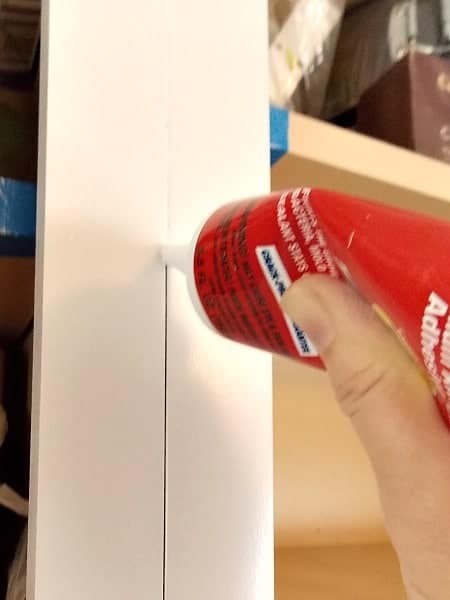 If you are painting the inside of the cabinet doors, you’ll want to flip them over and use the same process before putting the second coat on the front. Finally, apply a final coat repeating step 8. Let your painted doors cure well for a couple of days before rehanging them, so they don’t stick to the cabinets. Also, consider adding felt pads to the corners to cut down on banging doors. 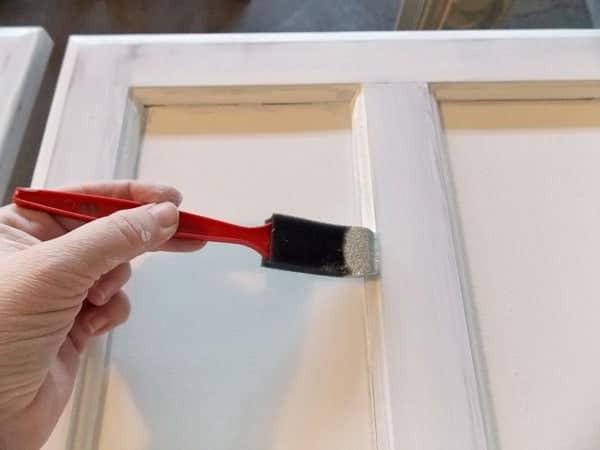 While your doors are drying, you can use this same process to paint the cabinet frames (which goes a lot faster, due to less surface area and less nooks and crannies!). I know this may not be the quick and painless way to paint cabinets, but it’s so worth it to come to the end of the project and have a whole kitchen that you can be really proud of, and you know will last a long time. Every time I walk into my kitchen, I love the way it looks, and I love knowing that I did it. For more details and tips, check out my post on Repainting Kitchen Cabinets, and best wishes for your own painting projects! Thanks, Meredith! Such a big job, but worth doing right to only do it once! Remodelaholics, pay Meredith a visit over at The Palette Muse to see her beautiful bedroom makeover, plus check out her tips for identifying your decorating style and this smart decorating tip. Build your own cabinet doors — two different styles! You can totally do this! Best of luck! I am currently right in the middle of painting my kitchen cabinets, so I’ve developed a system that is successful in my opinion. I gave each cabinet/door a letter (A, B, C … for wall cabinets; Ab, Bb, Cb … for base cabinets). I wrote the letter twice on blue tape, then stuck one letter in the cabinet and the other in the hinge bore hole (so I could prime/paint right over the hole) of the corresponding door. As Meredith says, prime before painting: I used Zinsser Cover Stain and actually did 3 coats of primer, sanding in between. I, too, am using the BM Advance paint with a Picasso brush and a small mohair roller; 3 not-too-heavy coats of paint, sanding in between. The Advance paint is great and levels very nicely, but you must wait 16 hours before sanding and recoating, so it takes time. My routine is to do a paint coat a day over three days. Then, the longer it cures the harder it gets and the better it looks! Oh, and while painting, once a coat has started to set up, don’t go over it with the roller! It’s a time consuming project, but I recommend these products and procedure. I really like the color you painted your cabinets. I’m prepping mine right now and have the white paint, but haven’t tinted it yet. I’m looking for something slightly off white because we have black appliances and I don’t want too stark of a difference. Seeing it in person, do you think your paint would look good with darker appliances? Also, maybe this is a silly question, but is your trim in your kitchen painted that same color, or is it white? I’m going to paint our trim and back door (in the kitchen) at the same time and am not sure if I should paint it the same color as the cabinets or go with basic pure white. Suggestions welcome! Thanks! Thanks Lindsey! Let me tackle the easy question first… Our trim is a slightly different white than the cabinets and it all works great together. I think you can’t go wrong with pure white on trim, even if your cabinets are a slightly different color. Otherwise you run into the problem of where the new color stops and your other trim color starts. Know what I mean? As for the color contrasting with your appliances, I do think it would look great, but I will say that this is still a white. It’s a warm, not-too-bright white, but it’s definitely still white and will contrast with black. I wouldn’t be afraid of the contrast, but if that’s not the look you’re going for, you might want to try a gray. I personally love black and white, and think it would look fab. I don’t know if you’ve settled on countertops yet, but that can be a good way to tie together the black and white too. I’d love to hear what you decide! Hi, I am thinking of tackling this project for my own kitchen. Do I need to use an electric sander or is there a grade of sand paper that I can use to smooth out everything? Getting ready to have our cabinets redone professionally. At the same time, he’s going to paint the kitchen. 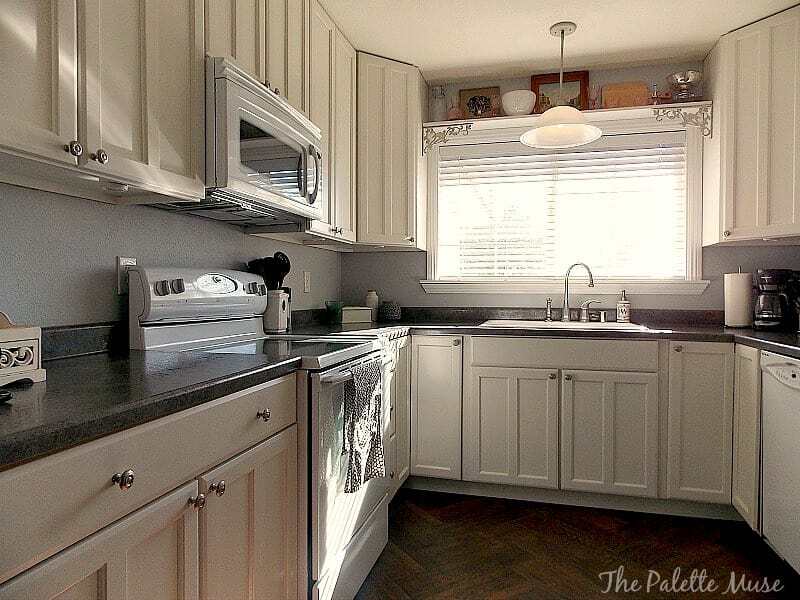 Would you recommend the ceiling be painted the same as the cabinets (I like your Totten’s Inlet, and may use that). Was this oil base paint or is it a latex? I was glad to find your post as we’re planning to paint our cabinets (bathroom and kitchen) before selling. I really love Benjamin Moore and planned on using White Dove on the uppers and Beach Glass on the lowers in the kitchen. I didn’t know Benjamin Moore made the alkyd, though, and was going to use Valspar’s alkyd. It would be fine, I’m sure, but I’d prefer BM.